Mike Shanahan will be the highest paid coach in the NFL this season, provided he doesn't actually coach anybody. Or talk to anybody. Yes, getting fired from a high-paying job is great work if you can get it. 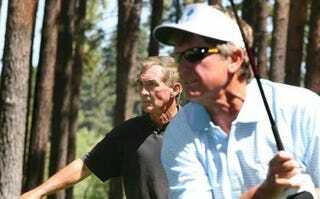 Shanahan still had two years left on his contract with Denver when the team fired him in January, giving him plenty of time to golf with Steve Spurrier. Woody Paige reports—seriously, he actually reported it!—that Shanahan has a clause in that contract saying that he will continue to earn his $7 million salary, provided he doesn't find another coaching job or say anything in public that might disparage the Broncos. Geez, I would have spent a whole year not talking about the Broncos for half that! Admittedly, it's very difficult to watch Kyle Orton quarterback any team without hurling a string of expletives at anyone within ear shot, but for that much cash I'm sure he'll manage. As long as Woody doesn't rat him out first. He told a friend privately that the Broncos have added some talent, and he expects them to be better this year. He told another friend privately that the Broncos made a mistake by trading Cutler for Kyle Orton. Shut up, old man! We're talking $7,000,000 here—don't you dare blow this!